A+ Images is a small family owned business. We are located on the west side of Indianapolis. We specialize in small orders and fast turnaround times. Our casual atmosphere makes it a fun place to work. Additionally, our production areas are climate-controlled! In other words, we have air-conditioned print rooms! For instance, you don’t have to worry about sweating in a hot warehouse all summer! Most importantly, there is a screen printer job opening. Are you the screen-printing guru we are looking for? 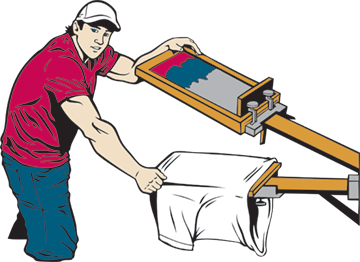 A+ Images is looking for an experienced screen-printing press operator. First, previous experience with automatic screen-printing equipment is required. Operators with Anatol printing press experience are preferred. Second, standing for long periods of time is required. Additionally, an extreme level of attention to detail is necessary. For instance, it is crucial to line up screens and shirts properly. Next, orders must be printed accurately. For instance, you must pay attention to ink colors, shirt sizes, and print quality. Finally, screen burning, screen setup, and squeegee cleanup are part of the job duties. We use a unique screen making system. A thermal printer burns the screens. There are no wash booths or emulsions to work with. 99% of jobs are one color. Occasionally, we print two-color jobs. We don’t print 3+ color jobs. We use DTG printing for that. Once trained on our system, we expect the ideal candidate to have enough screen-printing experience they can operate independently. We expect this to occur within the first week. We focus on quality, not quantity. Our best press operators maintain a less than one percent error rate. They do this will printing 75-120 shirts per hour. Standard work hours are 9-5 Monday through Friday. We may be able to offer flexible work hours once fully trained. Reliable transportation is required. This position should turn into full-time (with the ability to pick up overtime) by the end of August, if not sooner. Applicants that also have experience in other areas are preferred. For instance, experience with wide format Roland printers, DTG, or embroidery experience is beneficial. This is part-time position. However, it should lead to a full time position no later than the end of August. The starting salary is $12.00 to $14.00 per hour. Pay rate depends on experience, speed, and accuracy. Pay days are every other Friday. Aflac supplemental insurance benefits are optional after two months of employment. To qualify, you must averages 32+ hours a week. Do you have the ability to lift to 50+ lbs occasionally? Do you have basic computer skills? For instance, are you comfortable with basic Windows 10 operations? Are you able to quickly and accurately set up and take down multiple orders per day? For instance, one day you may print print one large order. However, another day you may print twenty small orders. Quick job setup is crucial to performance. Can you keep the screen-printing area & press clean? In conclusion, if you are able to answer “yes” to the above questions, email your resume to info@aplusimages.com. Do you have what it takes to fulfill our screen printer job position?